daily timewaster: The bankers are pikers. How about the federal government, through the Federal Reserve, inflating away the value of money to finance the nation's debt and goose the economy?? The bankers are pikers. How about the federal government, through the Federal Reserve, inflating away the value of money to finance the nation's debt and goose the economy?? Most folks can't grasp that you can steal the VALUE of money without stealing the money itself. Read "The Creature from Jekyll Island" by Griffin. Explains all to those who don't know. Requires an attention span of more than a few seconds! 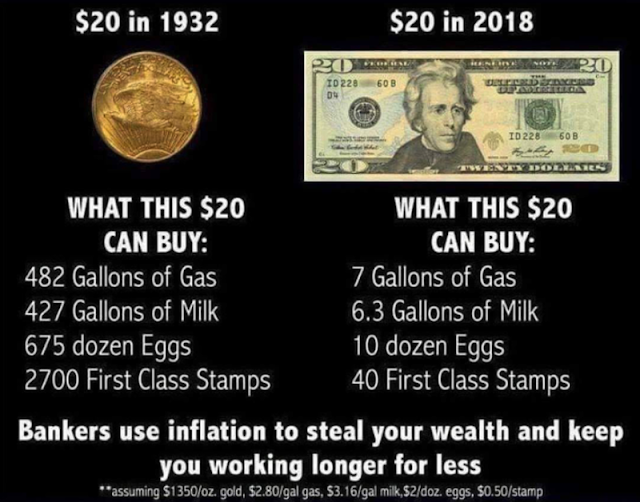 The time required to earn that $20 in 1932 for the blue collar guy like me, is a great deal more than what is required to earn (in gold) the equivalent today. As hard as it is to accept, we have it better today materially speaking. Whether it is better in how we spend our time, our families, or in relationship to God is up for debate. Henry Ford paid $5 a day, 6 days a week - $30 a week. Equivalent to 1.5 ozs of gold per week, or about $2000 a week in today Dollars, with no income taxes. 8k a month take home or 96k a year take home for blue collar labor. Not too many laborers taking home 96k a year today. In addition, gold price discovery is suppressed by the big banks through naked shorting in the futures market. If the gold price reflected the amount of currency created versus production, the price of gold would be many times more. The guy who made up the graphic is completely right and completely wrong. You can't accuse bankers of doing this without saying the Fed.gov is the one that tells them what to do and sets up the rules they operate under. Attacking the banks and not the government is like singling out the person who pays a bribe and not the person who accepts the bribe. They're both breaking the law. A $20 gold double eagle back in 1932 would buy a custom tailored 3 piece men's suit, with vest & two pairs of trousers. Today, that same $20 gold double eagle will still buy exactly the same thing; but that $20 worth of gold is now valued at $1293. Gold is still worth just what it used to be, but our paper money isn't. It is the Feds deficit spending that accounts for the majority of inflation. Want to feel old, fat and slothful? Watch this. Zero Gravity - dogs like it. Kinda cute...In a bitey sort of way.